First, in the podcast realm. Tomorrow is Gary Vaynerchuck's birthday. So make sure you go by and wish him well. I hate getting old.... Crap what did I listen to today? Oh well, I'll remember in like a week or something. 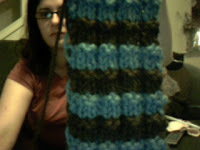 YAY For patterns on Ravelry! So if you have one that you like, please leave a comment, or chat me up at MaraJade97 on AIM, glswoman on Yahoo or at jadielady at gmail.com (@ symbol for the at and no spaces). *edit* YAY I REMEMBERED! I knew I would. I ordered some very lovely Christmas presents off of an Etsy shop. I can't link the store because its for 2 of my blog readers and they'll recognize pretty quickly what they're getting. But please support Crafters!